This conversation is with Jerome LaMaar. Jerome is known by others as The Style Monk. He is a creator and creative across all industries, sectors, and countries. He started working at Baby Phat when he was 15. He has been on the cover of The New York Times. His own clothing brand and work has been worn by Beyoncé, and he partners with leading brands like Google Pixel and Lyft for his vision, trend setting, and much more. In this episode, you will also learn about: 1) collaborating with brands 2) persistence 3) life-long learning 4) how Jerome also uses LinkedIn to build relationships and more! Excited for you to build and grow your Portfolio Career with Jerome! This conversation is with Earle Richards. After being a first among his peers in the Virgin Islands to have a computer, Earle became an early adopter of technology and its ability to improve things. Professionally, Earle is self-employed as a strategy and data analysis consultant. He has worked with many leading clients like General Mills, Bank of America, The Economist, Procter & Gamble, to name a few. Using his data analysis expertise to draw conclusions, Earle applies this same focus and lens to improve his personal life as well. On this episode, he provides tactical lessons and approaches here - mentioning many books and thought leaders that you are familiar with. Earle is laser-focused on PERSONAL experiments to improve the PRODUCT of Earle and his overall quality of life. There are a lot of designing your life and work-life integration lessons and stories in here for you. So tune in to build and grow your Portfolio Career! This conversation is with Erica Blair. Erica has been location-independent over ten years since college at Columbia University in New York. She grew up in Silicon Valley, but that was not enough to fuel her creativity, professional impact, and personal development. Working remote is requirement for any new projects. She is working on over 5 different projects right now: 1) experience designer for a global summit with Bancor; 2) messaging strategy for Everpedia, a direct-to-consumer blockchain product; 3) a decentralized collaboration @ BlockCollab; 4) Upstock project launch; and 5) brand strategy coaching. Things you will learn: 1) what a digital nomad is and what it is not. 2) How to find and price your freelance and project-work services. 3) The importance of updating your network on current interests, asking for help, and referrals. 4) the importance of community, building new relationships, and offering your expertise. Tune in to build and grow your Portfolio Career! This conversation is with Alexa Eden. Based on what she was hearing at Equinox, Alexa decided to leave to a lead #StrikeABalance movement. She is an Urban Wellness Consultant here in New York City. She helps individuals and brands have more purpose, connection, and growth while understanding how technology can help or hurt us. She has worked with brands like Equinox, Daily Harvest, Glossier to name a few. She led an underground meditation series in New York City. Things you will particularly learn: how to think about leaving a corporate job and setting yourself up for success. A better appreciation and understanding of the people and communities around us. So tune in to build and grow your Portfolio Career! This episode is with Marina Hadjipateras. Marina is the Cofounder and General Partner of Trail Mix Ventures and Vice Chair of the INTERTANKO Environmental Committee. Marina had a transformative professional experience personally working on ships in Korea a few years after college. In addition to this hands-on experience, she then helped take the company, Dorian, public on the New York Stock Exchange. She brings these invaluable insights and empathy to the founders and companies that she partners with at Trail Mix Ventures, a seed stage investment firm in New York City. You will also learn about the exciting trends of the wellness economy, how to form relationships, and the importance of staying in touch. So tune in to build and grow your Portfolio Career! This conversation is with Evan Wray. Evan was a walk-on to the football team at the University of Notre Dame. While also in school, he cofounded Swyft Media, which he led for over 6 years before selling the company. He has been named on Forbes's 30 Under 30 List and is now a Venture Partner at Trail Mix Ventures, a female-led investment fund focused on the wellness economy. Some things you will learn during this episode: 1) lessons learned from being a founder; 2) the importance of being present when working; 3) picking projects and partners wisely; 4) how to from relationships with people you respect; and 5) his role as a coach and mentor to portfolio companies at Trail Mix Ventures. So tune in to build and grow your Portfolio Career! This conversation is with Yin Lin. After immigrating from rural China to New York City, Yin has started and built companies and communities. Her only "real job" was a teacher with Teach For America, an organization she serves on a board of. She is the cofounder of SheWorx, a female collective reaching 7 cities and helping 20,000 female leaders. Yin has been recognized by Inc. as one of "17 Inspiring Women to Watch” and by CIO as one of the “Top 20 Female Entrepreneurs to Watch.” Her motto is "be uncomfortable." As such, she is constantly pushing herself physically and is on a mission to run a marathon and summit every continent. She is most recently the founder of Sage Vacations. This real estate investment company provides her the financial stability to support herself, those she cares about, and the flexibility to maximize her time and impact on pushing society forward. Tune in to build and grow your Portfolio Career! This conversation is with Stephen Warley. Do you want to work for yourself? Stephen’s mission is for you to be self-employed. He believes there is no better time than now to do so. You will hear how Stephen thinks it is risky to NOT BE self-employed. And that current work trends more than ever are encouraging you to be more --- well, YOU! His company, Life Skills That Matters, provides a ton of great self-assessments, resources, content, and services. So tune to build and grow your portfolio career! This is conversation with Georgie-Ann Getton-Mckoy. Georgie's professional title is an execution strategist! Does that sound like you? Things you will learn here: -her pivotal and inspiring realizations moving in from Jamaica to New York -how to use the power of being broke to your advantage -how her very popular annual GSD Summit with leaders like Gerard Adams and John Henry was unexpected -Do you have a regular tradition of service? Each year-end, she practices a "Help With Anything" to generously help professionals like introductions, review resumes, etc -She has a new book coming out. The Are of Getting Sh*T Done. Pre-order through January 11th. Her proven business growth tactics, tools, and tips are in the book for you. She would love your support. ... Tune in to build and grow your Portfolio Career and Hustle Muscle! This conversation is with Frank Denbow. Please see some highlights here: -Frank's journey and advice on how to get a job and build a network in the New York Tech and Startup ecosystem. -how Startup Threads (now INK'A) started as an unexpected side hustle and project. It then evolved by listening to and growing with customers. -some stories and insights not always shared, discussed or celebrated in the New York Tech and Business scene -the progress and 2019 vision of Inflection, Frank's community for bootstrappers in New York City. ....And so much more. Tune to build and grow your Portfolio Career! Nikki is the Founder and CEO of I/O Coaching in New York. She uses a science-based approach to help executives unlock their potential and better connect with their teams. Some of her clients include American Express, Peloton, Outdoor Voices, and Viacom. In addition to other notable accomplishments, she was a founding member of WayUp, the leading career development startup that has raised over $20 million. She believes listening is her signature-strength skill and one that she has practiced on improving over the years. We also talk about reframing your mindset to have more happiness, success, and fulfillment, and much more. So, tune in to build and grow your Portfolio Career! This conversation is with Muriel Clauson. Muriel is a researcher, speaker, and entrepreneur focused on creating a better future of work. She founded Oppticity, a data science company building “the skills map” to spark innovation around skill evolution for the workforce. She is a scientific advisor for several governments and organizations around the world. Her work and insights have appeared in publications such as the Wall Street Journal, Fast Company, and Forbes. She speaks on the Future of Work globally with organizations including the World Bank, Singularity University, the Milken Institute, United States Embassies, and more. She is really excited for the Future Of Work sector and opportunities within it — encouraging others to join! She provided her definition of a Portfolio Career and how to think about potential career transitions for you to build and grow your Portfolio Career. Tune in and let’s have some fun! This conversation is with Nataliya Makulova. Do you wish you had more energy in your life? Do you wish personal blogging could turn into a community and thriving business? This podcast is for you. Nataliya started her fashion business career as an entrepreneur at 19. She has had many exciting roles at companies like Spring, Marc Jacobs, and Vince, to name a few. And has achieved certifications from schools like London College of Fashions, Parsons, and FIT. She is currently the founder and CEO of Balanced Fashion, an event and consulting company. The company, community, and movement started when Nataliya began personally blogging while she was working at Spring a few years ago in New York City. Nataliya is equally passionate about personal energy healing and spirituality. She is an active Tarot Card reader and facilitates conversation about this for clients. We talk about key skills to build and grow your portfolio career. Tune in and let's have some fun! This conversation is with Krish Jagirdar. Krish talks about how he is currently working on multiple projects, including being a venture partner at Brand New Matter. After college, Krish had a diverse role and foundation-building experience at Dom & Tom. With this, Krish believes that he had key skills, and interests to add value to others with. He specifically mentions how important it is tell people what you are doing because he believes everyone (particularly in NY) has a friend that could help you out, if told and positioned the right way. Krish also talks about a foundational component of his current Portfolio Career is a business. A business that started simply as helping out a friend, then another one, and then word and referrals started to spread and comes his way. We talk about key skills and ways to build and grow your Portfolio Career. Tune in and let's have some fun! This conversation is Conor McCarthy. Conor started his career with a more technical and software engineering background. He then cofounded a festival which turned into one of the largest outdoor festivals in Ireland, City Spectacular (formerly the Street Performance World Championship) with over 200,000 people. He talks about philosophy and some key human reinvention moments he has had. One of which was related to an online workshop created by Seth Godin, the altMBA. Conor is now a coach in the leading, global online leadership program, in addition to his private coaching practice as well. He also cofounded a new company called, Empathy Test, which focuses on better understanding human behavior and reaction to new and existing products and services to help business owners. It's honor to interview Conor while he was in Ireland. We also talk about some key defensible skills for you to build and grow your Portfolio Career. Tune in and let's have some fun! This conversation is Christina Wallace. Christina wrote an article for Forbes titled Why Everyone Should Consider Building A Portfolio Career that has been a BIG inspiration and resource for me. She is a self-described “human Venn diagram” and has crafted a career at the intersection of business, the arts, and technology. In addition to being a 3-time entrepreneur, she is currently the Vice President of Growth at Bionic and co-host of The Limit Does Not Exist (a Forbes podcast), and a freelance writer, including as a contributor for Forbes.com. We talk about Portfolio Career frameworks and what questions to ask friends when seeking career advice. We also talk about some key defensible skills for you to build and grow your Portfolio Career. Tune in and let's have some fun! This conversation is with Gregg Clunis. Gregg is a Top 100 Self-Help Podcaster at Tiny Leaps, Big Changes with over 300 episodes in less than 3 years. Gregg is on a mission to test, learn, and share digestible daily habits and strategies to get the most out of your life. Based on the success and interest, Gregg recently finished a book on this called Tiny Leaps, Big Changes due in January 2019. Through his many projects and skills, he best describes himself as a Maker. We talk about his personal journey and tragedies, a shared experience for both of us -- both losing our fathers. This also inspired Gregg to write and produce just-released music songs. Gregg is also the founder of a podcast marketing agency called Podsimply. There is a LOT in here for you to build and grow your Portfolio Career. Tune in and let's have some fun! This conversation is with Steve Schlafman. Steve is a Venture Partner at Primary Venture Partners, a preeminent venture capital firm in New York City with investments in companies like Jet, Latch, and Slice. Steve has spent most of his career in the venture capital investment into startups with key roles at The Kraft Group in Boston, Lerer Hippeau, and RRE Ventures. Steve left RRE Ventures as a Principal in September 2017 and he talks about his career and personal transition journey. During the journey, he tested working on starting his own firm and also enrolled in an intensive executive leadership coaching program in New York City because of long-standing personal interests. He recently completed this program and believes it fundamentally complements his role as an Investor. And that it could also provide a desired lifestyle on its own, if worse came to worst. In spare time, he already had been leading startup founders and business executives in New York City and is now excited about helping those people further. His ideal portfolio career would consist of investing, coaching, and facilitating. We talk about many other personal and career development tips for you to build and grow your Portfolio Career. Tune in and let's have some fun! This conversation is with Tiago Forte. Tiago is a thought leader and practitioner in this emerging portfolio career sector. His viral blog post titled "The Rise of The Full-Stack Freelancer" had a big impact on me and many others. He recommends everyone to package their key learnings into products and digital assets as much possible, especially when leaving a job. He believes his true and somewhat evergreen job is a life-long learner. And to do so, he creates products and services from what he has learned. We talk about him leaving San Francisco to primarily explore his productivity methods as a digital nomad and try something new. And his online course, Building A Second Brain, that he is turning into a book for people dramatically enhance a meta-skill, knowledge management. There is A LOT here to build and grow your Portfolio Career. Tune in and let's have some fun! This conversation is with Alex DiPalma. This summer, she taught me and 100s across the world how to start and launch a podcast. The incredible summer program was led by Alex and Seth Godin called The Podcast Fellowship. The experience was profound and I learned a new skill for my portfolio career and much more. In addition to teaching a course at CreativeLive, Alex is a Brand Studio Producer at Midroll. And collaborates on other leading podcasts, like Akimbo and Food 4 Thot. Alex talks about how this freelance work develops new and sharpens existing skills, and great to meet new people. She talks about how her prior skills all came to together for her now, career advice for creatives, and podcasting trends. And so much more to build and grow your Portfolio Career. Tune in and let's have some fun! This conversation is with Anthony Yoon. After getting burned out as the Cofounder of DEED, a platform to connect people with volunteer opportunities, in New York, Anthony has been on a mission. A mission to live life on his terms -- the amount of work he wants to do, believing in himself to do work that he could do (i.e. emerging sectors like blockchain), and emphasizing more self-care and empowering others to do the same. In addition to specific personal and professional development tips and tactics for your Portfolio Career, Anthony ASKS that you find your tribe and community and share your feelings. A very powerful episode and I am so thankful for Anthony sharing it here. Thank you. This conversation is with Austen Allred, the CEO and Cofounder of Lambda School. The Company's revolutionary coding bootcamp business model enables students upon acceptance to join for no upfront cost and only payback if they get a job earning greater than $50,000. Students often double or triple their income, and sometimes are just on the edge of poverty before. The Company also provides career services for students to blog and showcase their work. Austen believes this is essential for everyone, and it led him to a job after authoring Secret Sauce. Lambda School is empowering people to learn new skills to find new jobs for their Portfolio Career. Austen talks about his primary drivers for the company and his vision for the company. And so much more to build and grow your Portfolio Career. Tune in and let's have some fun! This conversation is with Jeremy Redleaf, primarily self-described aa Creative Entrepreneur. In college, Jeremy started learning professional skills, relationships, and projects, this prepared him immediately post-college and people started coming to him for advice and help. Jeremy and a co-producer decided to turn this into a comedic short, Odd Job. Following the recession and a need, it came a PR hit gaining attention from CNN. Based on this, Jeremy decided to build an actual company, Odd Job Nation, to help people find jobs. This became a key professional milestone for Jeremy. It led to more film, content, and TV opportunities. From which, Jeremy decided to co-produce 3rd Street Blackout. More recently, Jeremy cofounded Caveday, a productivity and workshop community for freelancers, creatives, and companies. Jeremy talks about all of this and many personal and professional development advice from mentors. And so much more to build and grow your Portfolio Career. Tune in and let's have some fun! This conversation is with Alina Zolotareva. Alina is a creative and passionate registered dietitian nutritionist, marketer and product developer for one of the most innovative companies, AeroFarms, the largest indoor vertical farm in the world. A natural communicator, connector, and problem-solver, Alina is involved with many other projects regarding food, nutrition, public health and urbanization. She really opens up about her personal and emotional journey and her need for multiple projects to fuel her to be happy. And so much more to build and grow your Portfolio Career. Tune in and let's have some fun! This conversation is with Ashwini Anburajan. After graduating from Brown University, Ashwini worked in journalism and media covering Howard Dean, John Kerry, and Barack Obama in various roles. This vaulted her into an exciting and diverse role at BuzzFeed, but then Ashwini got urge to build her own company, OpenUp. This was not well-planned - so she had bootstrap and fund the company by creating freelance and consulting work from her friends. She then got accepted into 500 Startups, a prestigious accelerator program in San Francisco. After an unexpected turn of events to and with OpenUp, she launched a cryptocurrency company, 22X Fund, with fellow accelerator founder friends. As an early expert in the blockchain sector, this opened a lot of new doors and opportunities. We talk a lot about career development, creating earned media from scratch, story telling, business development, etc. And so much more to build and grow your Portfolio Career. Tune in and let's have some fun! This conversation is with Jeff Peterson. Jeff's Portfolio Career consists of being a MD and PHD student at the University of Miami, the co-host of A Bit Cryptic podcast, a host of a dinner series, startup advisor and more. Growing up, Jeff did not have the social and people skills that he has now. He really pushed himself and believes this skills and relationships are invaluable. We talk a lot about career development, asking for advice, self-care. And so much more to build and grow your Portfolio Career. Tune in and let's have some fun! This conversation is with Jonny Goldstein. Jonny primarily uses hand drawn graphics to help people like you make the world a better place. After working with people experiencing homelessness, Jonny became particularly interested in the arts and creative fields. Then, when attending a SXSW Interactive conference, he saw a professional graphical recording occurring. Jonny became immediately impressed and got hooked. That was his "aha" moment. Since 2009, he has worked for large companies, conferences, and community events, enabling revenue and learning variety. During his work, Jonny encourages others to draw and express themselves. Jonny has also directing a media production education program, hosting a talk show, and a teacher at New York University. After training himself initially, Jonny became a certified productivity coach and will soon launch a podcast. He has a lot of different skills, projects, and work in his Portfolio Career. In this episode, this is a lot for you to learn and grow yours too. Tune in and let's have some fun! This conversation is with Chris Bolman. Chris's Portfolio Career consists of being of a marketing, communications and technology strategist and is currently the CEO of Brightest, a technology platform for purposeful work and civic engagement and the cofounder of The Museum of Pizza, a new pop-up in New York City in October. Chris talks about four different components of his time and life design. He encourages people to try to get leverage with the four components of them. By pursuing different projects, putting yourself out there, and maybe failing, Chris believes you increase your surface area for opportunities and potential success. Chris talks about his learning experience as an early employee at venture capital backed- startup, Percolate. And so much more to learn and grow your Portfolio Career. Tune in and let's have some fun! This conversation is with Olive Persimmon. She "talks" in-depth about how she uses words to create stuff. While going in-depth about her professional and personal journey in New York, she mentions the different approaches and combinations of jobs, projects, and art to construct her portfolio career. She honed her craft, impact, and ultimate service to others by taking as much chances she could at places like Toastmasters. The recent TEDx speaker believes that communication is fundamentally the most important skills anyone can have. Tune in and let's have some fun! After playing sports growing up and working in the hospitality sector early on, Nick Kengmana learned valuable people skills and highly stresses the value of them now. Combined with sales and business development skills, Nick has been consulting with early-stage startups on growth. In addition, Nick is focused on building a social impact community in New York. Ben Bradbury talks about his journey to New York City and how he overcame financial stress to then having financial flexibility. He mentions his "three things" as a triangle for his Portfolio Career. By focusing on strengthen those three things over-time, productizing them, and then offering them free to new key contacts, Ben has been able to have his work contribute to a TED Talk. Linda Kristoffersen received tremendous advice and support from a new friend, leading to a great consulting job at a leading firm. Even more so since then, Linda has LEANED INTO new projects and opportunities, and actively gives back to others. As an engineer and technologist at heart, she brings her problem-solving mentality to her work. After having lived and grown up internationally, Linda is looking to solve world problems, and respects companies and leaders that seek to make change. Alex Portera is the Cofounder of Nowhere Men, a freelance writer and video producer. A decision to "just travel" and to participate in the Mongol Rally somewhat unexpectedly turned into the Nowhere Men. This Facebook Watch show has a weekly documentary style to it. In a short period, they have produced over 100 episodes with some episodes exceeding over 200,000 views. 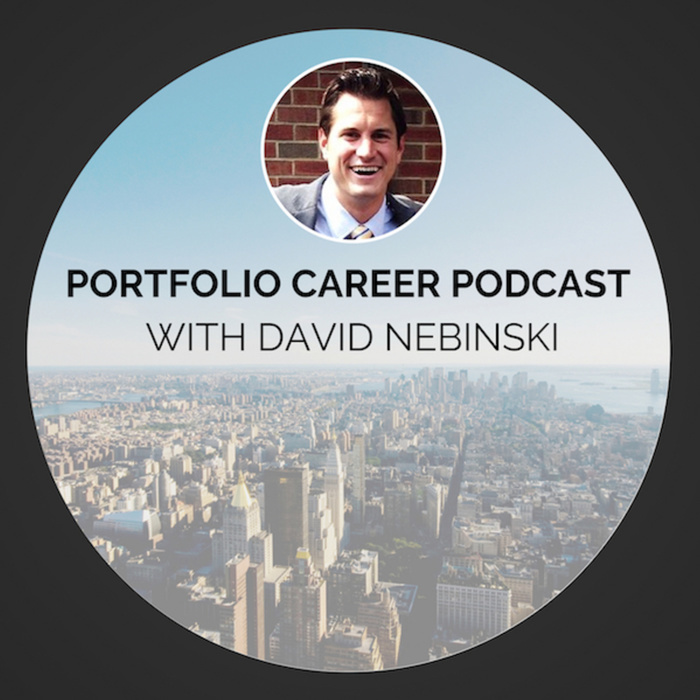 Please listen to this trailer to learn more about the Portfolio Career podcast. Hope you learn a lot to create and improve your portfolio career.